Reversing Falls in Saint John, Twice a day the powerful tides of the Bay of Fundy, the highest in the world, do something that doesn't happen anywhere else - they go up. The New Brunswick Museum provides a remarkable introduction to New Brunswick's rich cultural history and diverse natural environment. 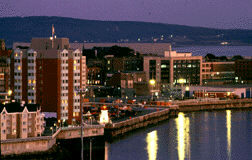 Located beside the Harbour in historic uptown Saint John , it is Canada's oldest continuing museum. Just minutes from the city of Saint John is an oasis of forest and marsh, beaches and trails. There are eight different walking trails of varying lengths, as well as a roadway that encircles the park. The geological history of this area is fascinating. It contains the pre-glacial outlet of the St. John River, as well as marine clay containing 12,000 year old clam shells. As Canada's oldest English-speaking university, Founded in 1785, the University of New Brunswick is one of the oldest public universities in North America.